Arigna Natural Gardens » Rhubarb. This is the rhubarb growing from stools which we obtained from our friends Denis and Rita in February. They always had a great crop from it. 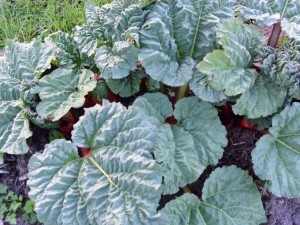 Rhubarb can also be grown from seed but the waiting time for a harvest is longer. Stools are basically the roots of the rhubarb plant. They can be dug up and divided and replanted every 5 years or so. Make sure a bud is attached to each stool and off you go. A harvest is not taken in the first year as this would reduce the plants vigour. They like a good mulch of farmyard manure in the winter. The leaves contain oxalic acid so are not edible, don’t think they’d be very nice anyway. If you soak the leaves in water for a few days until they break down the resulting liquid will keep away aphids and other nasties from your plants. Dilute at about 8 to 1. Spring is here, Summer can’t be far behind.